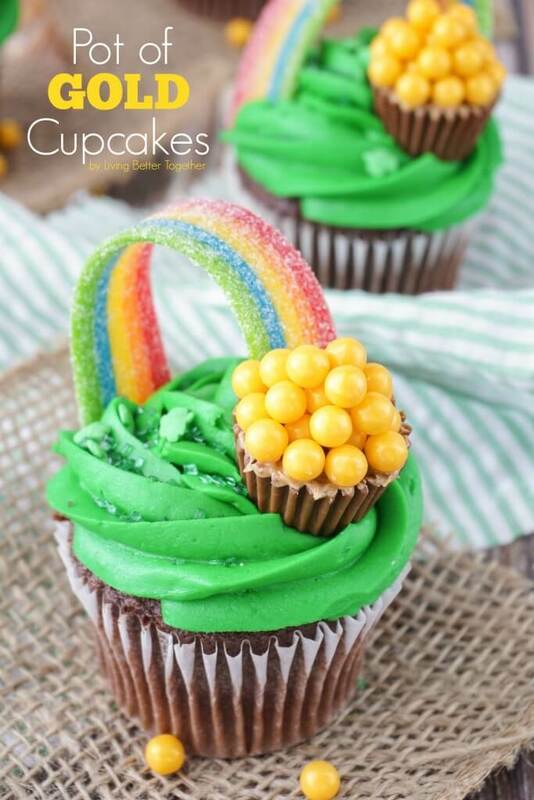 These Pot of Gold Cupcakes are perfect for St. Patrick’s Day! They’re simple enough to make and absolutely adorable! I’ve been dreaming of putting together these cupcakes since I picked up a bag of gold candy pearls in August. Yup, that’s right, I’ve been thinking about St. Patrick’s Day since August. It’s funny because we’re already a week into March and this is my first (and may be my only) St. Patrick’s Day post. The last couple of weeks have been a crazy whirlwind. Between having company, being involved in the largest pile up in Maine history (don’t worry, we’re okay), and all of the fun posts from last week, I haven’t even caught up on last week’s episode of Once Upon A Time. This weekend had a pretty full agenda too, but if I didn’t do them today, I wouldn’t get a chance to and I wasn’t waiting another year. No way! So I’m going to let you in on a little secret, because I believe that honesty is the best policy. Yup, you read that right, I totally cheated. You see, I’ve shared chocolate cupcakes time and time again, and I use the same base recipe. 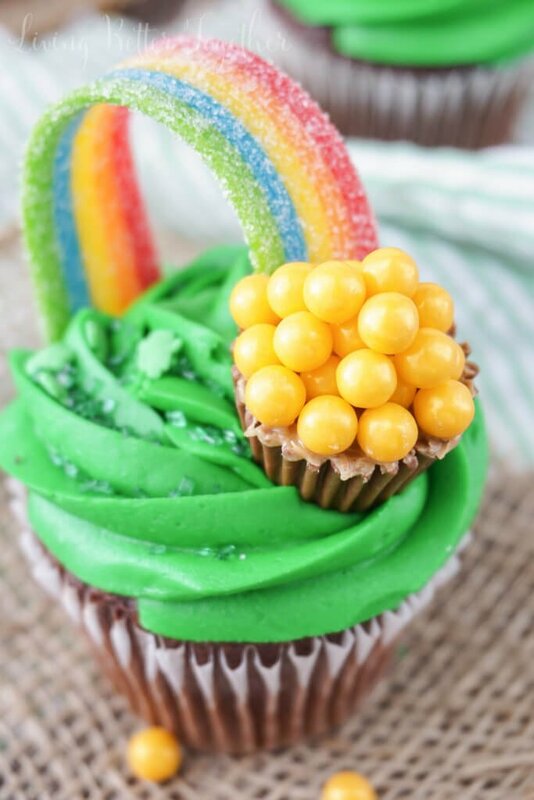 We’re all aware that you can make green frosting with a little bit for food coloring. 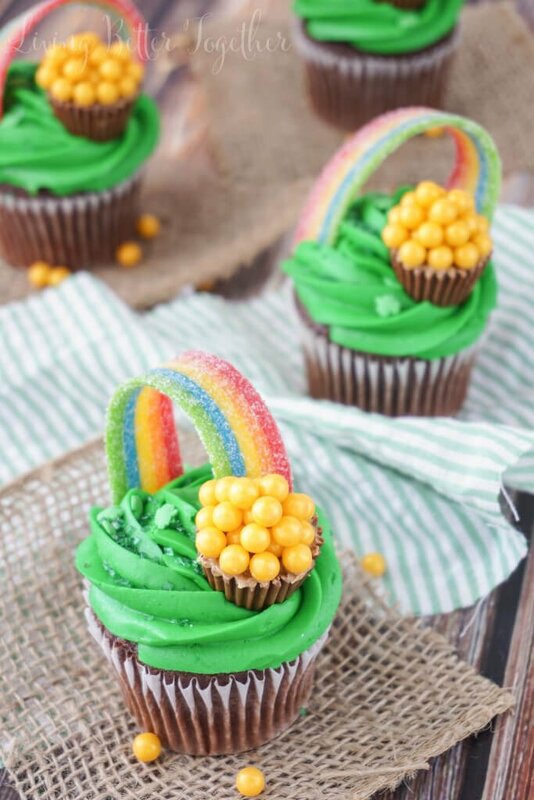 Since it was really the decorating of the cupcakes I cared about, why try to squeeze in making cupcakes on an already hectic weekend. So I bought the green frosted cupcakes from the bakery. Hello, $6.00 is less than I would have spent on ingredients and I don’t have to do any dishes! That’s what I call WINNING! Anyone here watch Black-ish? Did you see the episode where Andre takes over Rainbow’s wifely duties for a while? He has to make cupcakes for one of the kids classes and decides to just buy them at the store and all the mom’s think he’s the best. While,that kind of inspired me, work smarter not harder right? I’m so happy with how these turned out! They’re pretty stinkin’ adorable. It’s always nice to see something come to life just how you imagined it! I know a lot of you have busy schedules just like me, and while you want to make cute stuff for your kids, you don’t always have a lot of time. 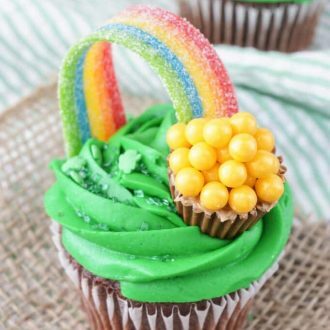 These cupcakes are perfect for those with a tight timeline. 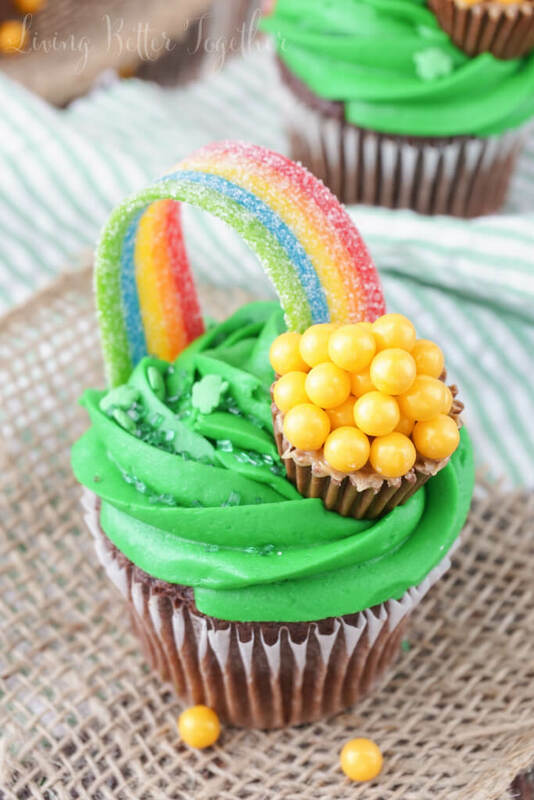 You can still have fun decorating and create some impressive cupcakes, but someone gets to do a lot of the heavy lifting for you! I’ll drink to that, am I right? But if you are in a baking mood, I’ve included the recipe for my well loved chocolate cupcakes and a simple buttercream below! 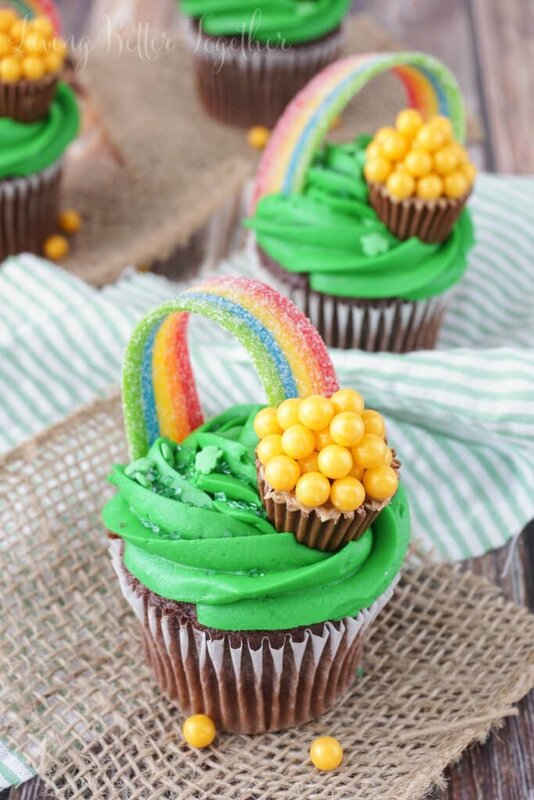 I hope you enjoyed these super fun cupcakes and if you’re looking for more great St. Patrick’s Day recipes, check out my Irish potato Candy or some of these fun recipes from my friends! In a stand mixer fitted with a paddle attachment, beat butter and sugar on low speed for about three minutes, occasionally scraping down the sides of the bowl. While whipping on low speed, add in vanilla, heavy cream, and gel coloring and turn the speed up to medium high to whip for 1-2 minutes. Using the back of a small spoon, even spread a tiny bit of peanut butter on the peanut butter cup. Stick the candy pearls to it, as you stack, gently touch each pearl to some peanut butter before adding it to secured it to the others. 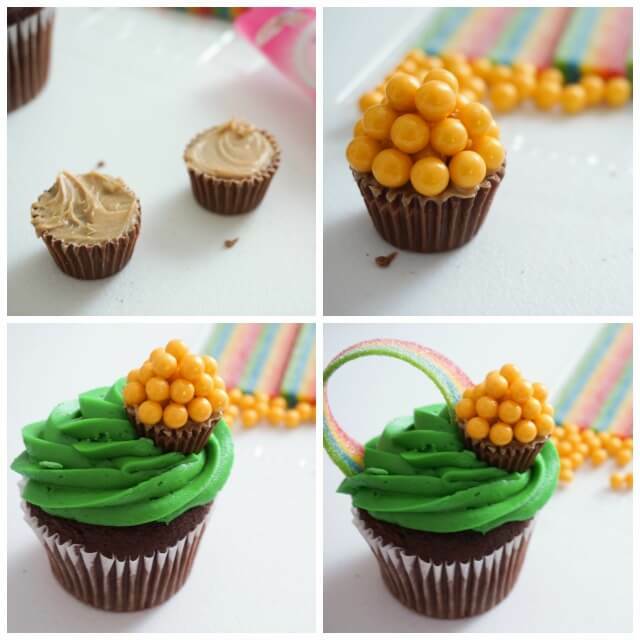 Press peanut butter cup into the cupcake frosting. 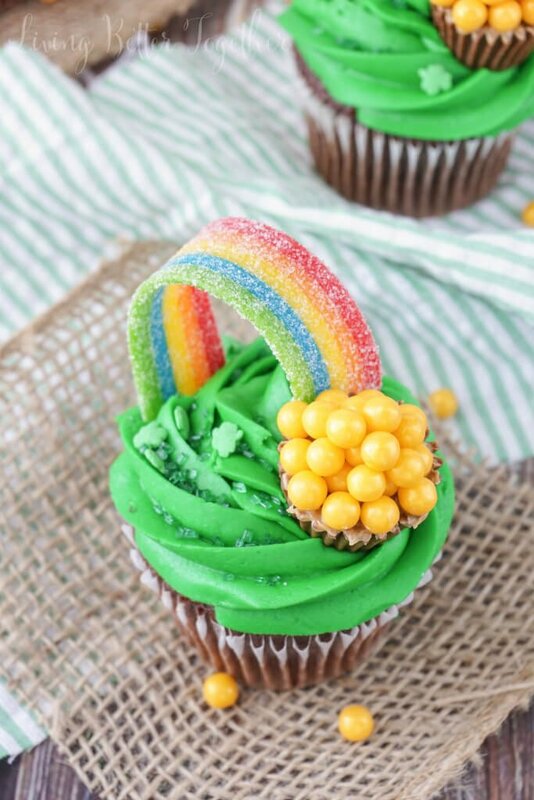 Take Airheads Extremes and stick each end into the frosting to make the rainbow. You can use a toothpick to help support it. Any suggestions on what to substitute the peanut butter with? I’m planning to make them for my daughter’s baseball team but a few are allergic to peanuts. Hi Lizzy, For the peanut butter itself, you can simply swap that out for any frosting. As for the peanut butter cups, that could be a little trickier. I know Trader Joe’s used to sell Cookie Butter cups and those would work, if not I think you could just use another chocolate candy with a similar shape. If you were feeling ambitious, you could also make chocolate cups at home with mini cupcake liners and pans and make either a cookie butter, sun butter, or ganache filling of your own. I made a version of these for a farewell party for a manager. Everyone loved them and my daughter loved helping me make them! I wanted to post pictures but wasn’t sure where.